Have you ever wondered who gets bigger pay increases? Those who work for private companies and firms or those who work in the public sector (National, provincial and municipal government employees)? 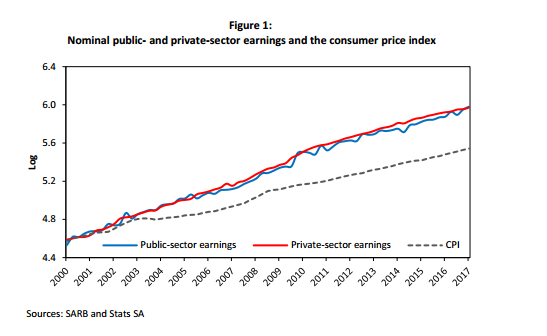 Well a working paper published by the South African Reserve Bank (SARB) investigated this and found that pay increases between the private and public sector is near identical. We take a look below. So is the noise about government employee pay increases overrated? The image below shows the growth in public sector earnings, private sector earnings as well as the growth in the inflation rate over time. And readers will notice that pay increases in both the public and private sector has outstripped growth in inflation by quite some margin. According to the working paper the following is said "A visual inspection of the data signals that private-sector earnings progress relatively smoothly, with only some cyclical responses, while public-sector remuneration is much more volatile. The CPI is quite smooth but shows more pronounced cycles. The nominal public- and private sector earnings grow, on average, by 2.0% per quarter (by 8.1% and 8.2% respectively when annualised). Consumer price inflation amounts to 1.4% per quarter, which is equivalent to an average annual inflation of 5.6%. ​ While the rate of earnings increases in the public and private sectors is nearly identical, development in the public sector is much more volatile than in the private sector. The standard deviation of public-sector remuneration is about 2.5 times as big as in the private sector. This feature is preserved for the deflated earnings. In other words, consumer price inflation does not contribute to earnings volatility. The higher volatility of public-sector earnings must therefore have other reasons. Worthwhile to note is also the fact that the ratio between average nominal and average real earnings growth is above 5, which is unusually high, even for an emerging economy"
So why is the public sector earnings growth more volatile? The image below shows the growth in real earnings (after earnings have been adjusted for inflation) for both the public and private sector. And as the image shows the red line which represents the private sector is a lot smoother than the blue line which represents the public sector. So why is the public sector earnings so much more volatile? Well the paper doesnt provide reasons for why the earnings of the public sector is more volatile than that of the private sector, but it runs a few statistical tests in a co- integrating relationship is tested and causality is looked at and from this it is determined that public sector wages follows private sector wages. Basically growth in salaries of public servants follows growth in salaries of the private sector and not the other way around. Thus for policy makers it points to the fact that public sector wages should not be attempted to be "anchored" to inflation as public sector wages does not grow at the same rate as inflation, but rather follows wages and salaries of the private sector. Thus if government and SARB wants to ensure salaries grows at the same rate as inflation, they will have to convince private companies to pay inflation linked salaries. This will be hard to do as job seekers will go to those firms that pays the most and offers the highest pay increases.